Even though I'm tempted by some of the new, post-Teflon "non-stick" cookware, I resist. They're just too new to know for sure if they're any safer. And there's a history in this country of replacing bad chemicals with different bad chemicals. No thanks, not in my kitchen. In my kitchen, it's guilty until proven innocent. And the cookware I know is "innocent" is (y-a-w-n) the same stuff I've been using - and EWG has been recommending - for years: cast iron, stainless steel, and oven-safe glass. But how great that a few boring, cheap, available choices are the answer to environmentally healthy cooking?! Never preheat nonstick cookware at high heat -- empty pans can rapidly reach high temperatures. Heat at the lowest temperature possible to cook your food safely. Don't put nonstick cookware in an oven hotter than 500 degrees. Use an exhaust fan over the stove. Keep pet birds out of the kitchen -- the fumes from an overheated pan can kill a bird in seconds. Learn more here. Skip the self-cleaning function on your oven. It cleans by heating to high temperatures, which can release toxic fumes from non-stick interior oven parts. 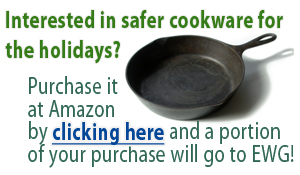 Choose a safer alternative (cast iron, stainless steel, oven-safe glass) when buying new cookware. What's the problem with non-stick pans, anyway? Non-stick surfaces are aluminum pans coated with a synthetic called polytetrafluoroetheylene (PTFE), also known as Teflon, a DuPont brand trademark. Learn more about Teflon and its perfluorinated chemical "family" (PFC's) in our chemical dictionary. Toxic fumes from the Teflon chemical are released from pots and pans at high temperatures, potentially killing pet birds and causing people to exhibit flu-like symptoms (called "Teflon Flu" or, as scientists describe it, "Polymer fume fever"). You're exposed to PFCs in other ways, too We've talked before about the many ways we're exposed to PFC's, so while skipping the non-stick cookware is pretty simple, we recommend that you limit your other exposures, too. Food wrappers are one common source - minus the PFC's greasy food would leak right through those glossy wrappers. Get our 1-page guide to PFC's and start avoiding them today. This is tip 6 in EWG's Healthy Home Tips series. Read the first 5 and sign up for the rest.